Join me as I make a new fall project, today! In yesterday’s post I explored the built-in embroidery designs on the PFAFF creative 3.0. 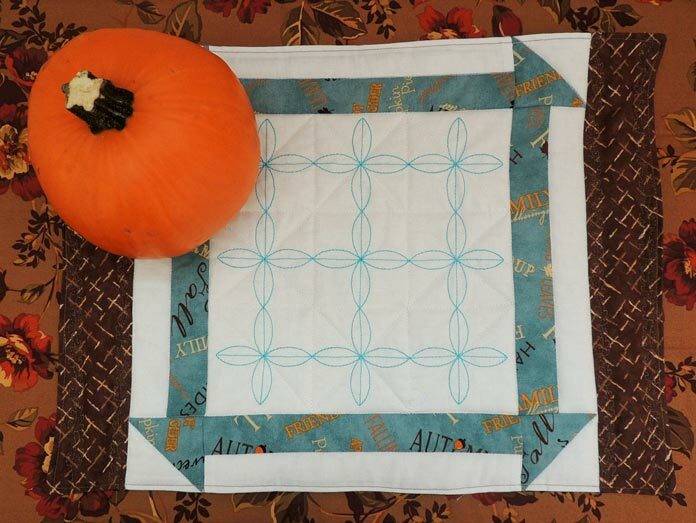 I chose the biggest design I stitched out to make a one of a kind tabletopper, Autumn Bliss. Before I started sewing the tabletopper together, I removed the embroidery unit and put on the original accessory tray. I also took the time to clean around the bobbin after all that embroidery play! You can see how easy it is to remove the bobbin case and clean a PFAFF machine in my earlier post 6 easy steps to keep your sewing machine spotless and running well on QUILTsocial. I can’t stress enough how important it is to keep a sewing machine clean for trouble-free sewing. Stitch out an over all embroidered design and trim it to 8½” square. 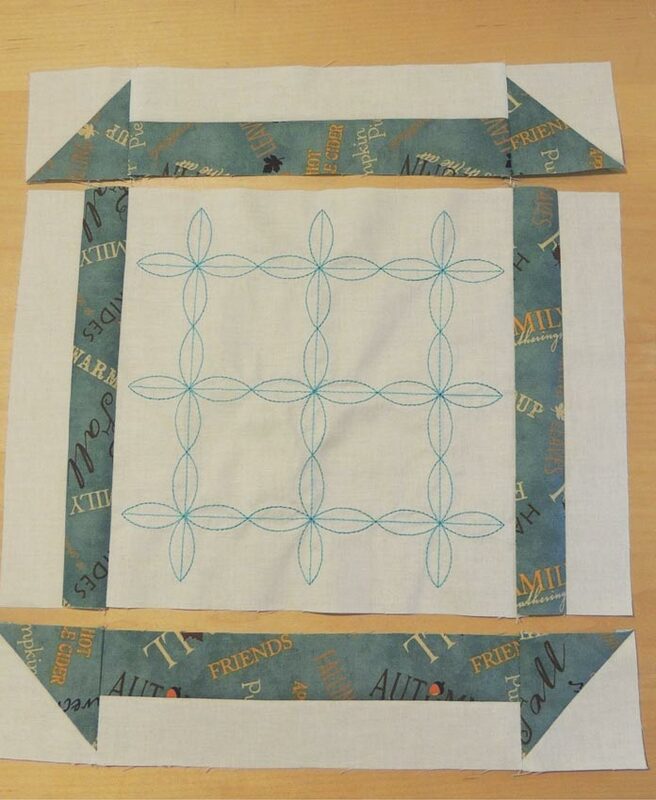 On wrong side of the white 3″ squares, draw one diagonal line on each. 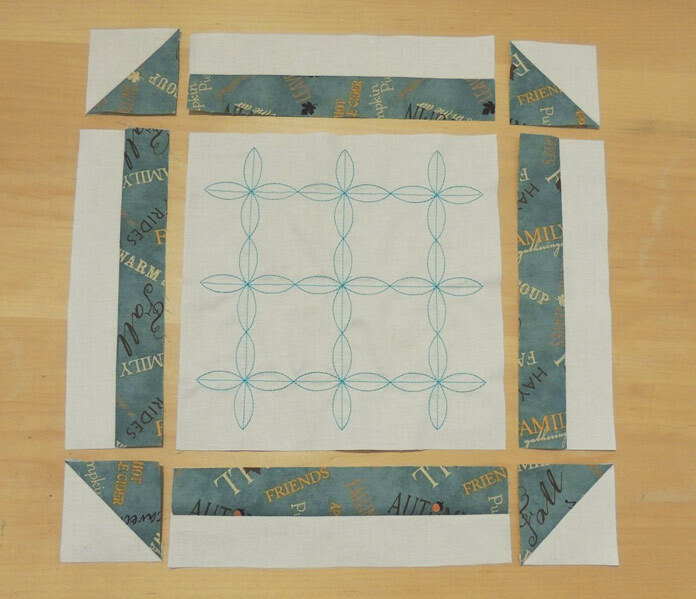 With right sides together, sew a white square and fall print square together by sewing ¼” seam on each side of diagonal line. Cut on diagonal line and press the seam to the fall print. Trim each HST to 2½” square for a total of 4 HSTunits. Sew together one white strip and one fall print strip to make 4 pairs. Press the seam to the fall print. Sew with the fall print to the bottom of the unit and the fall print on the HST to the strips. Press the seams to the strips. Sew the remaining two white/fall print strips to the center unit with the fall print to the center unit. Press the seams to the center unit. See the photo for direction. Sew one HST/strip/HST unit to the top of the center unit and one to the bottom. Press seams to the HST/strip/HST units. 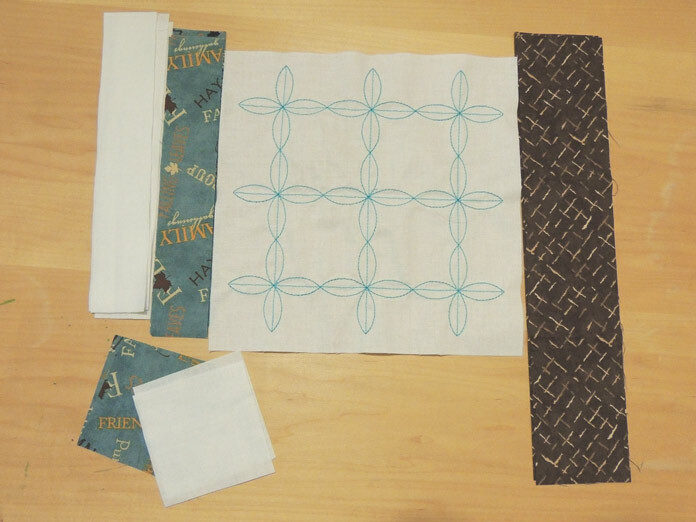 Sew one coordinating fabric strip to the left and one to the right to complete the table mat top. Press the seams to the coordinating fabric strips. The tabletopper top is complete. 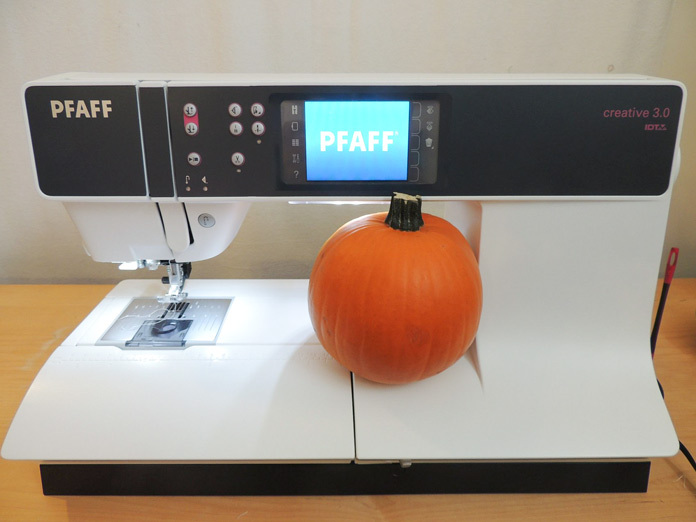 Sewing with PFAFF’s creative 3.0 is precise and fun! Join me in the next post to quilt the tabletopper with some more fun stitches from PFAFF.